This chapter engages with one of the central discussions in the study of nationalism, the debate about the modernity or antiquity of nations and nationalism. 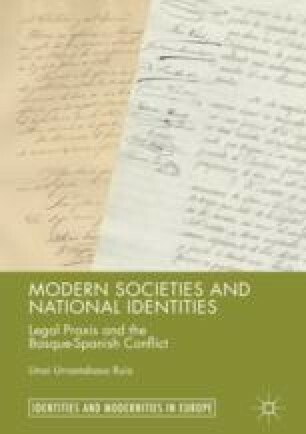 Noticing the political dimension contained in the dispute, the chapter highlights the extent to which a concept of law resting beneath theories of modernization plays a key role in interpreting nationalism and associated political claims. The prevalence of such a concept of law, and how it influences interpretations of political action, is explored in definitions of key terms, such as absolutism and constitutionalism, and in the justification for a regime change proposed in the “Declaration of the Rights of Man and of the Citizen.” I argue that such a legal presumption often leads to taking for granted the legitimacy of the state, contributing to the pervasiveness of methodological nationalism. The latter “must be rejected because the history and main features of the nation-state are made artificially to coincide with the history and main features of modernity itself” (Chernilo, D. (137) Methodological nationalism and its critique. In G. Delanty & K. Kumar (Eds. ), The SAGE handbook of nations and nationalism (pp. 129–141). London: SAGE, 2006). The original version of this chapter was revised. An erratum to this chapter can be found at DOI 10.1007/978-3-319-60077-2_10. Oxford Dictionary of English. (2010). Politics. http://www.oxfordreference.com.ezproxy.is.ed.ac.uk/view/10.1093/acref/9780199571123.001.0001/m_en_gb0644850. Accessed 20 Feb 2015.